Harry and Cam receive awards at 2019 NDT banquet at the University of Minnesota. 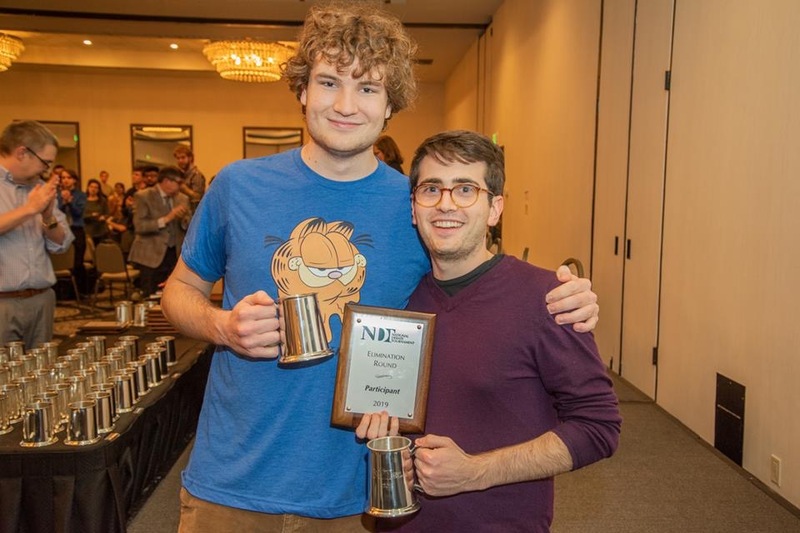 Harry Aaronson and Cameron Dehmlow Dunne arrived home to Bloomington from the 73rd National Debate Tournament (NDT) with hardware in hands, including a double-octafinalist plaque and a top tournament speaker award. The duo won five of their preliminary debates to achieve what no other university in the state of Indiana has done for more than 50 years, debate in the first single elimination debate of the NDT as one of 32-remaining teams in the bracket. With 80 teams entered at the tournament, each team must debate and win more than fifty percent of their eight preliminary rounds to qualify for these “outrounds.” The 2018 NDT had IU narrowly miss qualification to outrounds by just one ballot in their 8th debate round against Harvard. This year, a win against Baylor during round seven tipped the Hoosiers into the first elimination debate against California Berkeley. IU AD, the code they are known by in the community, lost to Berkeley in their final debate of the year while defending a new affirmative about treaty withdrawal and the political question doctrine. Each of the five judges on the panel praised the team for their arguments, skill, their individual accomplishments and what they have done for their University. The team qualified to the NDT as the top seed out of our regional NDT District, which includes Northwestern, Michigan, Michigan State and Purdue. The qualification marked the sixth trip to the NDT in program history. The first instance was in 1993, followed by 2014, then the recent streak from 2016-2019. The common denominator in the four-year-streak has been Mr. Aaronson, who qualified to the NDT every year since he has been on the team. Of the annual 160 qualified competitors at the NDT, very few achieve the notable distinction of being a four-time qualifier. Debate tournaments recognize teams for their wins (final places) as well as individual debaters for their eloquence. Each debater is awarded speaker points after each round by their judges, these speaker points are then added up to differentiate rankings. The top 20-speakers are recognized in a tournament-wide awards banquet. Harry walked away from this year’s banquet with due recognition that he is the 3rd best speaker in the nation, a monumental rise of forty places from the previous year. Before the NDT, Harry and Cameron had already achieved historic performances for Indiana Debate. Prior to the district qualification tournament, the program applied to be one of the sixteen “first round at large bid” teams with an automatic bid to the NDT. IU AD fell just short of this goal with a year-long recognition that they were 17th in the nation, a new height for the team and a clear recognition of the potency the partnership had over the course of the season. Two weeks prior to the NDT, Harry was also recognized by the community of the American Debate Association as the debater of the year. Brian DeLong, IU’s Director of Debate, was also awarded the Coach of the Year award from the organization. These individual awards and the season long success are a recognition of the individual drive that was combined with a team of 20 students and assistant coaches, Jacob Bosley and Hope Reamer, who helped raise the profile of Indiana Debate. As the season comes to a close, the Debate Team would like to thank our institutional support from The College of Arts and Sciences, The O’Neill School of Public and Environmental Affairs, and the Hamilton Lugar School. Their combined resources have provided us with a platform to produce a nationally recognized competitive team that is dedicated to pedagogical and civic development of debate on campus and the region.